City of Miami officials are working now on plans for the 2017 Miami International Boat Show on city-owned Virginia Key. The hugely popular show is just three months away. At its Oct. 27 meeting, city commissioners approved five agreements granting temporary access to certain locations on the island to the National Marine Manufacturer’s Association (NMMA) Inc., the company that puts on the annual event. 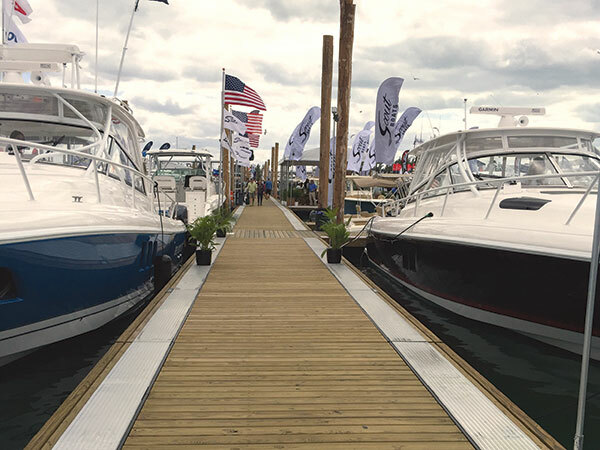 As a condition to approval of the access agreements, the city manager’s office was directed to address an access issue that allegedly occurred during the 2016 boat show, the first year it was held on the key. The city owns the bulk of the barrier island and has several lease agreements with for-profit and non-profit entities. A revocable license that city commissioners approved in January 2015 granted the NMMA the right to use the land and water surrounding idled Miami Marine Stadium, and other adjacent city-owned parcels, to stage the annual show. The license authorized the creation of access agreements along Virginia Key, subject to commission approval, according to a staff memo from City Manager Daniel Alfonso. NMMA will pay the city 50% of profits obtained as a result of the boat show, as called for by the license, Mr. Alfonso wrote. Esther Alonso of Virginia Key Outdoor Center LLC spoke at the October meeting, complaining that access to her business was cut off by activity related to the boat show. She has a license with the city to operate a recreational business at 3801 Rickenbacker Causeway, offering equipment rentals, paddleboard instruction and more. The center is on the northeast portion of the island, off of Arthur Lamb Jr. Road. Ms. Alonso said vehicles and staging activities tied to the boat show damaged a green field next to her leased site. She said her business suffered because of a lack of coordination between the city, the association and other leaseholders on the island. “I shouldn’t be affected by their lack of planning,” Ms. Alonso said. Commissioner Ken Russell said her complaints were reasonable and he asked that the city manager’s office look into the matter and make plans to avoid the same situation during the 2017 boat show. Mr. Russell said he’d like to see a list of lessons learned from the 2016 boat show and how they will be addressed the second time around. A grant to NMMA of temporary access rights to use a portion of city-owned property at 3801 Rickenbacker Causeway for staging, parking, shuttle service and other ancillary uses during the 2017 show and future boat shows. A grant to NMMA of temporary access rights to use Marine Stadium Marina at 3501 Rickenbacker Causeway “for the purposes of providing parking, restrooms, exhibition space, concession space, and other ancillary uses, including but not limited to, installing and removing tents and providing demonstrations” during the 2017 show and future shows. An access agreement between the city, the Miami Rowing Club and NMMA, granting NMMA temporary access to city-owned property at 3601 Rickenbacker Causeway for operating food and drink concessions, staging, accessing and using utilities, providing rowing demonstrations and lessons, and other ancillary uses in preparation for and during the 2017 show and future shows. An access agreement between the city, Miami Virginia Key Beach Park Trust and NMMA granting NMMA temporary rights to use city-owned property at 4020 Virginia Beach Drive for providing shuttle services and parking during the 2017 show and future shows. An access agreement between the city, Bayside Seafood Restaurant Inc. and NMMA granting NMMA temporary rights to use city-owned property at 3501 Rickenbacker Causeway for restrooms, exhibition space and concession space, including installing temporary tents, accessing and using utilities, preparing food and beverages, and other ancillary uses. Village of Key Biscayne officials have been at odds with the city since it allowed the boat show to use parts of Virginia Key. The barrier island links Key Biscayne to the mainland via the Rickenbacker Causeway. The city entered into a license agreement with the NMMA, and allocated more than $20 million to make improvements to the area around the long-closed stadium, with plans for other non-specified events on the site. Village officials and residents objected to the boat show on Virginia Key, saying it would worsen traffic and endanger wildlife and the environment. Opponents also voice concerns about the city’s future use of the property and waterfront stadium, saying the changes were too intensive. The city and the association touted a successful 2016 boat show in February, saying a big part of the positive outcome included water taxis and shuttles to reduce the number of private vehicles. Until the “flex-park” idea is removed from the lease agreement, the plan stinks. A huge permanent expanse of artificial turf for parking with no shade trees– which later can be used for soccer– is a Frankenstein monster. It makes no sense aesthetically or realistically. Why not have the boat show at Port Miami? On the SW end where there was talk about building a soccer stadium? They can set up temporary floating docks for bigger boats and display the rest under temporary tents on land. Getting to and from would be a breeze since the tunnel is open. The show could also tap the thousands of tourists waiting to catch a cruise or returning from one. Not a lease. A revocable license agreement is what NMMA Boat Show has with the City. It’s a public record. Thanks for the mention. One clarification — Virginia Key Outdoor Center has a LEASE with the City not a license agreement. The license agreements (multiple) that create boat show’s access is forcing our closure and disrupting out business. We are a small family run business and cannot afford this disruption. We are not alone in this. NMMA goes out of its way to deceive and damage. There is a lot more to this story. The City earns 50% of any potential profit. Last year that was ZERO dollars. When can the City expect the Boat Show (NMMA) will ever report a profit and pay percentage rent? When will the City’s $24million investment be returned? Neither is likely to ever occur through or from NMMA. In the interim you have a 24 million dollar project receiving 1.1 million in rent for 4-months access to Marine Stadium and access to the surrounding parks in which, in my opinion, they destroy park grounds, damage community resources, and pay ZERO dollars. What is the cost to the City? That too must be deducted from the 1.1 million rent to truly calculate what benefit the City and its residents receive from the boat show. What are the long term losses? Miami Beach still gets the hotel business as does Miami but that’s no different than it was before NMMA Boat Show moved to Virginia Key.